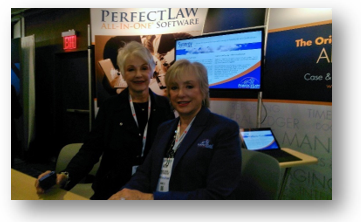 Those of you who know me, know I have been attending the “largest legal trade show” (aka LegalTech NY) held in New York City, for years. 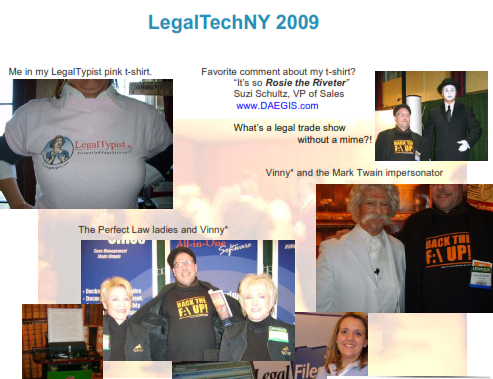 In fact, I just realized that 2017 marks my 10th year attending LTNY! That’s a full decade of braving the bleak and nasty January weather of NYC, with just one exception, 2010, which I dubbed Ice-A-Palooza as all of NYC was literally frozen over so badly mass transit was shut down and I could not physically get into the City. … and 2017 was no different! I did go in to snuffle; I did enjoy the hustle; I also enjoyed hosting a dinner and I got my hugs and one-on-one conversations. This was also the first year I requested and was provided an official Press Pass. To start, I thought it extremely odd that ALM was charging a fee just to enter the vendor Expo Hall. The fee ranged from $15 (if you thought to look before 12/31) and went all the way up to $115 if you registered on site. None of those who normally attend with me were willing to pay in order to get sold to, and I really don’t blame them. When I spoke with the vendors, I mostly received surprise about the new fee. They had no idea. Some, upon reflection, believed it would stop those just there to grab the swag and candy. My thought: isn’t that what swag is for? So lots of people from lots of different places grab and keep it? For instance, I still have the @LitSoftwareApp phone holder I received years ago. It sits on my desk and makes me think fondly of the company even though I still don’t have or use an iThing! I get it though. Except I think those they are referring to are the homeless – who in the past would grab the passes thrown out by those leaving and literally dine on the food stuff put out by the vendors. Obviously, charging a fee won’t stop this practice – better security is the only answer. As for the rebranding of the event – it’s still only 3 days long so the rebrand to LegalWeek is truly confusing. Also confusing was the hashtag. Most events have 1 hashtag. 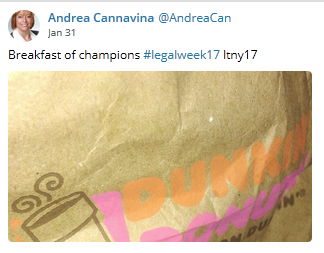 There were several for LegalWeek, and the one I thought they would use in order to match the new name “LWNY” was not one of them. #LTNY17 and #LegalWeek17 were the two most popular. Given I was on a full press pass and able to go into any session, I was really looking forward to attending some of the educational sessions this year and live tweeting like in the old days. While I appreciate that ALM was gracious enough to extend me a full Press Pass, they did not think the group of 10-12 attorneys I normally bring with me as worthy of entry to even just the Expo. That necessitated cancelling my annual Swag-A-Thon and the lunch I host each year right before it. This also effectively removed all the fun stuff I had planned for Day 2. So when you add up my inability to locate the actual rooms, coupled with the confusion over which of the newly created mini-conference tracks would actually be of interest or value, with the cancelled fun stuff on Day 2 – I chose not to take another day off of work and only traveled in the one day. Armed with my coffee and a knapsack containing only the most absolutely necessary items (so I did not blow out my shoulder), I headed out before 6am with my bullet journal, two fully charged battery packs and the ShareFile multi connector I got as swag last year. Previous years had already taught me to munch on something on the way in order to stop my overly loud rumbly tummy around bowls of candies in the Expo Hall, so I grabbed a coffee cake muffin from the Dunkin Donuts right across from the Hicksville LIRR station. Upon arriving at the Hilton, everything was set up pretty much the same as it had in years past, sign in and Expo Hall on the upper level. There was a very short line for check in and I was handed my pass and not really anything else. I stood there a moment, thinking the person had forgot to hand me the bag with the pamphlets, flyers and other eye candy and giveaways of their vendors. Nope. When I asked how I was to find the sessions, I was directed to download the app; but no one could help me when I mentioned I used a Windows based device. Similar to recent years, once in the Expo Hall I noticed it was not jammed. In fact, given the price was anywhere from $15 to $115 just to get in to see the Exhibits, I was actually surprised to see as many people as I did. 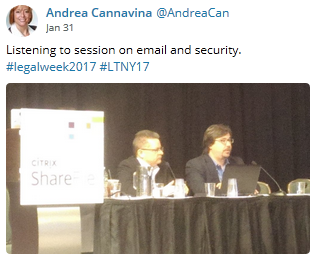 This entry was posted in Andrea C on February 14, 2017 by Andrea.